From the beginning stages of our walk with God, and throughout the rest of our life in Him, the enemy continually attempts to erode our confidence in God. Full assurance of our eternal life in Christ is a major arena the enemy targets. If he can get us to doubt our salvation or believe it isn't eternally secure then he can cause us to weaken our trust in God concerning other areas of life. The enemy works overtime with the aid of religious tradition and a wrong image of God to foster doubts and stir contrary reasoning within our minds and hearts. This is why we contend for the faith. We contend for the gospel of Christ. Look at the grace gospel Paul preached. The gospel is the good news of the Finished Work. Take note of the "order" listed here if you will. Paul proclaimed the gospel message. By the power of the Spirit flowing through him, the gospel message was confirmed with signs following. Paul concluded the gospel message, by ministering the full assurance of the Finished Work. Religion withholds assurance. They want to see how well you produce fruit before they can say for certain you are genuinely saved. Religion fights the message of an assured eternally secure salvation. Religion treats salvation as some probationary status for believers. Religion has portrayed a false image of God who takes on new family members on a trial basis. If they produce just enough fruit then they have earned the right to sit at the Father's table. There is nothing new here, this is simply the enemy working to deceive the Church into believing righteousness can be achieved by works and performance, not by grace through faith. The Word is clear in 1 John 5. We may know we possess eternal life. Why? Because we simply put our trust in Christ alone to save us. After having placed your complete trust in Christ, you have full assurance or confidence that Heaven is your home and you will never again taste spiritual death. 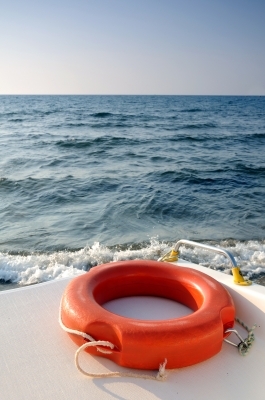 Grace is the safety net or life preserver in the troubled times. I heard a story about the construction of a famous bridge. When the workers were at such high heights they feared falling so they weren't focused on the construction but on their own safety. When safety nets were added, their fears and concerns fell away. Workers were no longer intimidated or fearful of falling. They knew the safety net would catch them. The result of the safety net? Work productivity increased. Religion believes by teaching you have confident assurance in Christ and should rest in His eternally secure salvation you're giving folk a license to sin. What they fail to understand is the power of grace and confident assurance. When the believer knows there is a "safety net", they will naturally be more fruitful. They don't have to fear being cast aside or displaced from the Family of God if they fail or falter or fall. Religion perpetuates an image of an angry God who simply tolerates His Church. The Word of God said of old that He rejoices over us with joy. Religious tradition teaches He broods over us with wrath just waiting to strike when we miss it. When it comes to the issue of forgiveness of sins, religion alludes to a concept that God sometimes withholds forgiveness. The image painted on the canvas of the minds of many believers by traditional religion is that God may withhold His mercy and grace from you when you blow it once too often. I have actually heard a minister teach a congregation that if you keep sinning that same sin God doesn't have to forgive you. Of course, they cited some out of context Old Covenant passage. This image perpetuated by religion discourages believers and keeps them wrapped in the arms of insecurity and lack of assurance. Am I saying that one should be comfortable or find solace in their sin or mistreatment of others?Absolutely not. Sin hurts us and others. What I am saying though is there is freedom in Christ, by virtue of the Finished Work. I am saying lay down the false image of God religion has established. Religion perpetuates an image of God as someone who doles out love and mercy when we are more deserving. God demands we forgive others regardless if they ask for it or apologize. Yet He withholds forgiveness if we don't "apologize" or confess our sin to Him. He demands we forgive someone regardless of how often they offend us. Yet He has reserved the right to withhold forgiveness if we sin the same sin too much. He demands that we don't keep a record of others faults. Yet He holds our sins over us unless we "repent". This is the image the enemy longs to plant in your heart and mind through religion. The truth of God is He has already forgiven us of all sins when we received that free gift of eternal life. We are forgiven of past and present and future sins. God isn't holding our sins against us. God doesn't hold us to a standard He wouldn't honor Himself. He is a merciful Father, no matter how much we miss it, grace abounds toward us, so we can walk free from all bondages to sin. When we rest in perfect love there is no more fear. We have perfect assurance. We rest in perfect unchanging love. God only has our good in mind. Once you've received this free gift of eternal life, rejoice in confident assurance. You are saved, you are redeemed. You are irrevocably saved. Rejoice in the Father's lavish love for you.